La Laguna Beach Club & Dive Resort is as close to the beach as you can get! 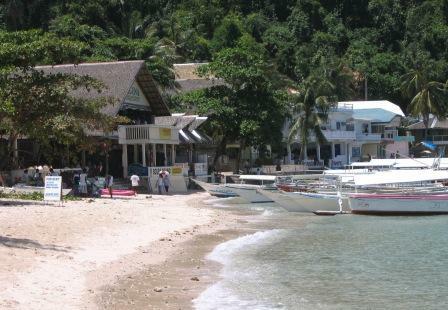 La Laguna Beach Club, the friendliest in Puerto Galera. is my accommodation of choice when in Puerto Galera. It is nestled on the best beach, Big La Laguna Beach and literally has the ocean at the front door. You are always made welcome with a friendly smile and a cold san mig on your return, it is those small touches that make the La Laguna Beach Club feel like your home away from home. This laid back resort is owned and run by some Australians and the Australian hospitality has been taken up by all the staff. Nothing is too much trouble, the office and administration staff can organise your transportation and check flights for you. As you would expect from a resort, the LLBC has 31 rooms mostly facing the swimming pool, which is behind the restaurant. Of the 31 rooms, 28 are air conditioned with the other three fan cooled. If you can go for the air conditioned rooms the comfort is well worth it. All the rooms have mini bars, cable TV and hot and cold running water, the rooms are clean and tidy and very liveable. The restaurant and dining area greets you as you walk up the beach and front stairs, to the right as you walk in is the La Laguna Dive Shop. Directly above the Dive Shop is the Gecko Bar, aptly named due to the hundreds of geckos that inhabit the resort. The geckos are good as they eat all the bugs and they do a fantastic job! You can get an idea of how much accommodation at LLBC will cost you here. Or have a look at Tripadvisor's recommendations, compare prices and bookings for La Laguna Beach Club & Dive Center. 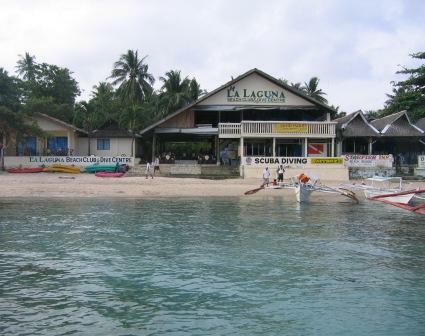 The La Laguna Dive Shop is a PADI 5 Star Instructor Development Facility. From here you can undertake in any number of dive courses from Open Water entry level, through to Instructor and Technical courses. What better way to learn to dive! The ocean is 26 degrees celsius the ocean is on your front door step and you also have a specifically designed swimming pool to do your confined water sessions in. This is easy diving, diver numbers are kept to a minimum so that your enjoyment is not diminished. That Aussie personal touch also finds it way into the Dive Shop. for what you can expect if you go diving at Puerto Galera, also my top 10 dive spots. The food menu at LLBC is very extensive and caters to international and local foods. Don't be afraid to try something different, let's face it, you are on holidays after all, why not try a local dish, the waitresses will be more than happy to explain what the local dishes are. One of my favourites is the banana-mango shake a great refresher with breakfast. Upstairs in the Gecko Bar you will find one of the best views you will ever see, I never tire of it and can sit for hours watching the sun set. There is definitely something captivating watching the ocean while sipping on a cold beer. Pull up a bar stool, order a drink and a bite to eat and settle in for another night in paradise. Once the sun has set and darkness has moved in, try your hand and a game of pool, there is always someone willing to have a game with you. Or watch your favourite sporting event live from the TV strategically placed near the bar. The Gecko Bar is something special, views to die for, great hospitality and icy cold beer, it is times like these that you forget all your stresses from home and that little murmur in the back of your head says wouldn't you love to live here! Yes I think we all would! How much will it cost at La Laguna Beach Club? You can get an idea of how much accommodation at La Laguna Beach Club will cost you here. For further information on Puerto Galera have a look here. For the best ways of getting to Puerto Galera have a look here. For other reviews of accommodation in Puerto Galera have a look here. Have YOU stayed at the La Laguna Beach Club & Dive Centre Puerto Galera? Share your tip or review on the La Laguna Beach Club & Dive Centre with everyone!